Tuesday again, this means T-Stands-For-Tuesday over at Elizabeth's blog, where we share a drink related post every week. My used teabags are drink related for this week's fun. I don't know how blogger calculates that - but as I read those five names I realized that those friends not only very often leave comments for me but always leave such pleasing comments as well. How can blogger know this? Your comments mean a lot to me!! Gratitude is the vitamin for the soul! im Junk Journal mit getrocknetem Pflanzenmaterial ( Mikrowellenmethode) und gebrauchten Teebeuteln für Art Journal Journey . Ich hab außerdem meine TOP 5 Kommentatoren ermittelt ( das Widget findest Du rechts in der Seitenleiste) und ich mache wieder bei TSFT mit diese Woche . Wonderful pages, so pretty! Happy T Day! Some more beautiful, nature-inspired pages! I love how you arrange everything so perfectly. A gorgeous journal spread Susi, I love how you used the tea bags and the dried flowers, did you use a spray of lavender?, its such a pretty colour. I was interested to read about your Top Commentators Widget, I honestly never noticed it in your side bar. It is a great pleasure of mine to call in here and see your fantastic art. Grossartig das Doppeljournal mit dem Vitamine für die Seele eine tolle Idee liebe Susi! Wunderschön mit diesen getrockenen Pflanzen und deine alte Teebeute! Hui da bin ich ja auch dabei bei dem Widget rechts !!! Du bist aber auch Spitze in deinen Kunstwerken die ich so gerne an sehe und wie du es machst ist immer so spannend und du bist so eine liebvolle, nette, mutige, künstlerische so begabte Frau .. das muss ich dir doch mal schreiben!!! Wow...deine Fantasie kennt keine Grenzen. Herrlich mit dem Lavendel. Jetzt sieht es nicht nur toll aus sondern duftet auch. Richtig tolle Idee. A beautiful and positive spread Susi! I love the teabag background to the flowers, a lovely contrast! ein schöner spruch, kannte ich gar nicht. und tolle Texturen wieder... Mikrowelle hab ich keine, ich presse noch in den fetten kunstkatalogen (Telefonbücher gibt's ja auch nicht mehr;)). und falls die Mikrowelle nicht die Duftstoffe zerstört, kommt dir jetzt beim blättern immer ein lavendelduft entgegen, auch schön!! AH, yet another widget that I should probably not install, but more than likely will. It's an honor to be number 1 at something for a change (grin). I feel honored for some reason. As always, you make gorgeous art, and I simply adore the nature inspired piece you created. Adding the tea bags made it even more beautiful. Those microwaved flowers are simply getting a lot of use, aren't they? I need to some flowers, ANY flowers, I too can microwave. Thanks for sharing your incredible nature inspired tea bag art with us for T this Tuesday. Simply wonderful. Now I'm off to check out that new blogger widget. wow,deine lavendelseiten sind wunderschön und ganz bestimmt gut für die seele,ich liebe lavendelduft. ich hab auch ein paar seiten die duften,das ist herrlich. had to have another look at your beautiful journal spread:) Happy T day! I love the soft look of your page and the lovely sentiment. Happy T Day! How amusing about the top commentators, and how interesting to know. I wonder over what period the comments are counted, must investigate. I love the lavender and teabag pages, very unusual art materials. Your journal will smell very nice. Elizabeth is wonderful. I don't know how she keeps up with us all. It's very thoughtful of you to recognize her efforts. That's a beautiul gratitude spread, Susi. It's so soft and ethereal. Love it! Beautiful spread...love the sentiment and the dried flowers! sweet and thoughtful... fun new widget too. 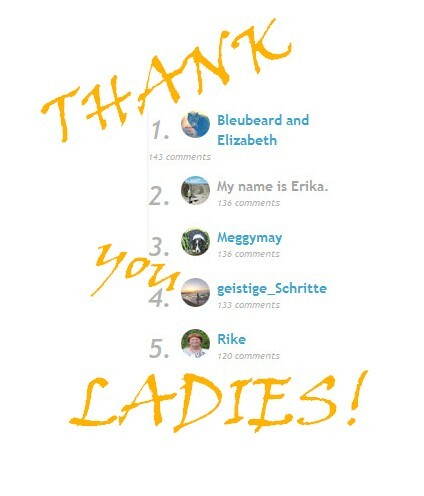 somehow I am not surprised that our dear E. is the top commenter...a faithful and true friend. Happy T day! Love the way the microwaving keeps the colours in the flowers - and this is a beautiful page because of it Susi. may your week be filled with joy. Deine Lavendelseite ist superklasse. Diese Mikrowellenmethode muss ich mir gleich mal anschauen. Noch nie davon gehört. What a wonderful spread, Susi, and that quote is just outstanding as well. I must try that microwaving for foliage...great and colourful results! I love the wording as well! Oh so cool...more dried flowers and teabags..